The 2016 Oregon State Championship ("Oregon Closed") chess tournament was contested as a round-robin the weekends of February 6-7 and 13-14-15, 2016 in Portland as detailed below. Rounds began at 10:00 AM and 4:30 PM. This year an additional 10-player invitational section was added. Grisha Alpernas was the TD and collected the game scores. Players were selected according to the OCF Bylaws. Information: (also see OregonChessFed.org website and Grisha Alpernas Facebook page). Usual formats and prizes. Time control is 40/120, SD/55; d5 (slightly different than last year). Players in the Championship needed to send a $50 deposit which was returned after completion of all rounds. Prizes (championship section only) are $200 for 1st place, $100 for 2nd, $50 for third. Best wishes and Good Luck to you all! Pairings were made using the round robin table from U.S. Chess Federation's Official Rules of Chess, 5th Edition, Page 296. 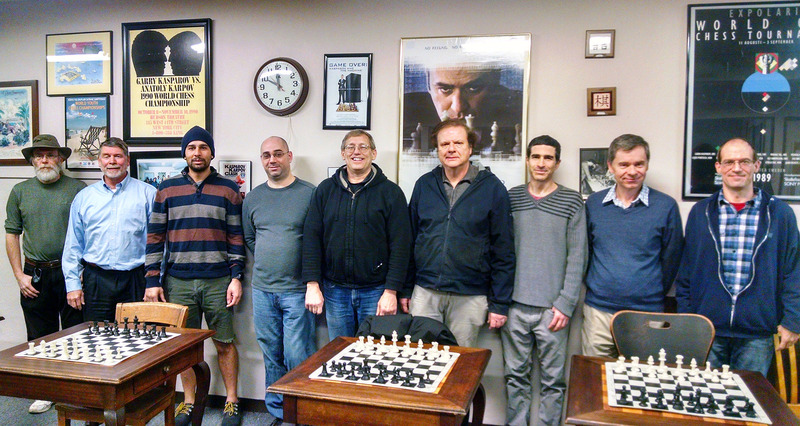 The drawing of starting numbers was held in the Portland Chess Club on January 30 (Saturday). Championship Section: See the crosstables (PDF file). See the pairings (PDF file). Invitational Section: See the crosstables (PDF file). See the pairings (PDF file). See the final USCF crosstable. The pairing numbers are also shown in the crosstables below. Feb. 6-7 at 10:00 AM and 4:30 PM. Feb. 13-14-15 at 10:00 AM and 4:30 PM (except only one round at 4:00 PM on 2/15). 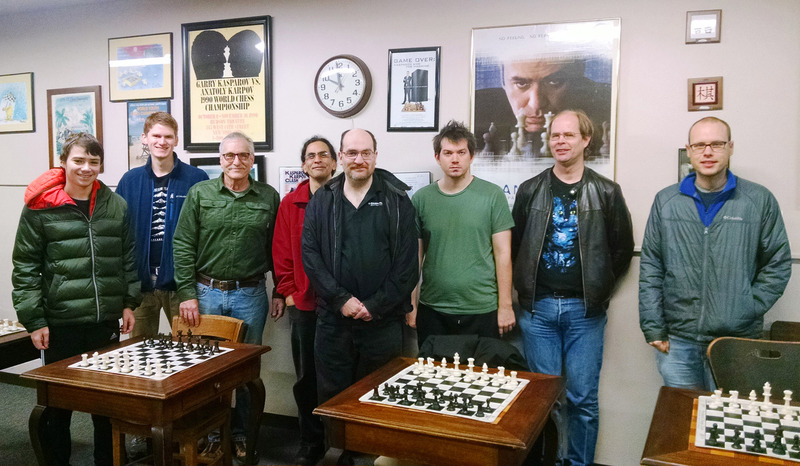 Portland Chess Club, 8205 SW 24th Ave, Portland, OR 97219. See www.pdxchess.org. The official opening ceremony was held before the first round on Saturday, February 6. Click on photo to view a larger version. Left to right: Carl Koontz, Gregory Freeze, Gunther Jacobi, Sean O'Connell, Steve Surak, Bill Heywood, Moshe Rachmuth, Steven Deeth, Jerry Sherrard. Congratulations to Carl Haessler for winning the Oregon State chess championship! Carl first won the championship in 1991 (tied with Richard Wood), and is now a five-time winner (including ties)! Titles: FM = FIDE Master, NM = US Chess National Master, LM = US Chess Life Master. Prizes: $200 (1st), $100 (2nd), $50 (3rd). 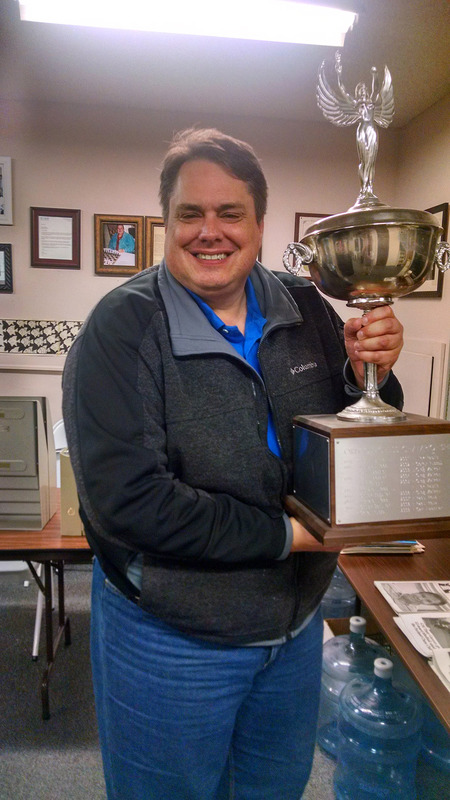 Congratulations to Bill Heywood for winning the Oregon State invitational chess championship! Due to illness we had two last minute withdrawals and ended up with 9 players. The crosstable has been updated. Organized by the Oregon Chess Federation. Tournament director: Grisha Alpernas. Assistant TD: Mike Morris. Look for a report in a future issue of NORTHWEST CHESS. For subscription information, please see our magazine info page. Previous OR chess championships: List of winners (includes links to event summary pages).